American Sniper and the political battle over Chris Kyle. Clint Eastwood’s film is a lot more than just red meat for red-state moviegoers. Bradley Cooper in American Sniper. For years it’s been a film-industry truism (and, one imagines, a studio-boardroom cautionary tale) that movies about the wars in Iraq and Afghanistan perform poorly at the box office. Kimberly Peirce’s Stop-Loss, Paul Haggis’ In the Valley of Elah and Paul Greengrass’ Green Zone asked searching questions about the human costs of America’s post-9/11 interventions—questions that echoed through near-empty theaters. Kathryn Bigelow’s The Hurt Locker and Zero Dark Thirty presented the Iraq war and the hunt for Osama bin Laden far more ambiguously, as moral crucibles that tested their heroes’ strength of character much as these conflicts have tested the nation’s. That nuanced, patriotic-yet-critical stance helped to earn Bigelow’s films widespread plaudits (including a history-making Oscar), decent box-office business, and more than a little public pushback, notably from those critics and viewers (like John McCain) who saw Zero Dark Thirty as a retroactive justification for torture in the bin Laden manhunt. What the hell is going on? Why is American Sniper touching so many nerves, provoking so many big statements and confusing qualifiers, selling so many tickets, and provoking such partisan bluster? It’s been, after all, nearly a dozen years since the invasion of Iraq and almost as long since most of the country—including many who had initially supported the war, and many who fought in it—began to realize with dawning horror that our intervention there was turning into a bloody and directionless quagmire. Why this film, and why now? American Sniper (which was written by Jason Hall) has a perspective that’s recognizable from the classic Westerns Eastwood has long been associated with, both as an actor and a director. It’s an existential critique of violent machismo that doubles as a celebration of violence. With more cinematic craft than he’s displayed in a while, Eastwood makes the viewer alternate between fear for Kyle’s life and fear for the lives of the people who cross through his gun sights—more than once, women or children, whom he must decide whether or not to shoot based only on fragments of unreliable information. 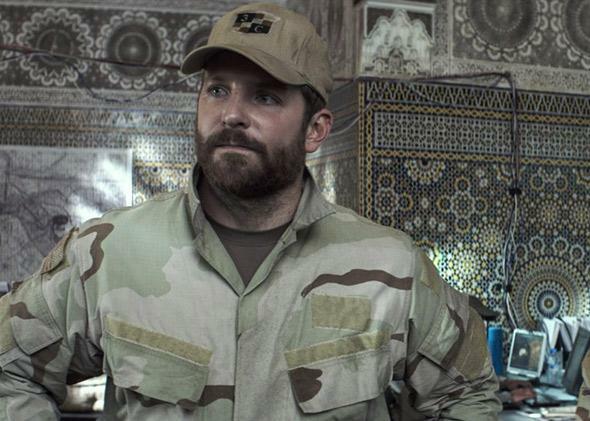 There are moments when American Sniper unabashedly revels in its hero’s skill at marksmanship—he’s the fastest shot in the Middle East, a Navy SEAL with an unequaled 150-plus “kill record.” One climactic scene has Kyle trying to nail an opponent from a rooftop a mile away; I won’t tell you whether the bullet hits its mark, but we accompany its journey from Kyle’s gun in slow-motion close-up, which tells you all you need to know about that moment’s tone. But the movie’s occasional triumphalism doesn’t mean Eastwood presents Kyle’s relationship to his deadly work as morally untroubled. On the contrary—the toll Kyle’s military service takes on his mental and emotional health, and the damage his unacknowledged PTSD does to his marriage to the devoted but fraying Taya (Sienna Miller), becomes the almost exclusive focus of the second half of the movie. The tension in their marriage feels almost like the lead-up to a psychological horror film about domestic violence—at least until an unconvincingly easy late-movie reversal, in which Kyle somehow lifts himself out of paralyzing anxiety and depression without ever acknowledging the hold they had on him. Still, there’s undeniably something upsetting about Eastwood’s tendency to film the Iraqi characters as an undifferentiated mass of potentially menacing “others”—an inbuilt xenophobia that’s not uncommon to this director’s films, though it’s arguably present in nearly every Hollywood movie about a Middle Eastern conflict (not to mention the cowboys-and-Indians Westerns to which this movie’s ethos harks back). I think I get why American Sniper has deeply moved some audiences, and I certainly understand why it has made others angry. For myself, I found it powerful, touching, and only occasionally infuriating, and I think Americans who care about the way we remember the Iraq war—onscreen and off—should see it.